Giving in to the call of the mountains, we made our way to this ‘fairyland’ at the foothills of the splendid Garhwal Himalayan ranges. The ‘Queen of the hills’ as it is poetically called, Mussoorie is just 35 km from Dehradun, the state capital of Uttarakhand. I have never been on a pre-planned vacation! Our travel plans are always spontaneous, very last minute 🙂 We think of a destination, pack and go. And just like that, with a few basic reservations we were on our way to Dehradun and then to Mussoorie! As our cab made its way from Dehradun on a steep, winding but scenic road the landscape changed gradually. Gentle cool breeze greeted us, a welcome respite considering we were getting roasted at 38-39 degree C in Nasik. 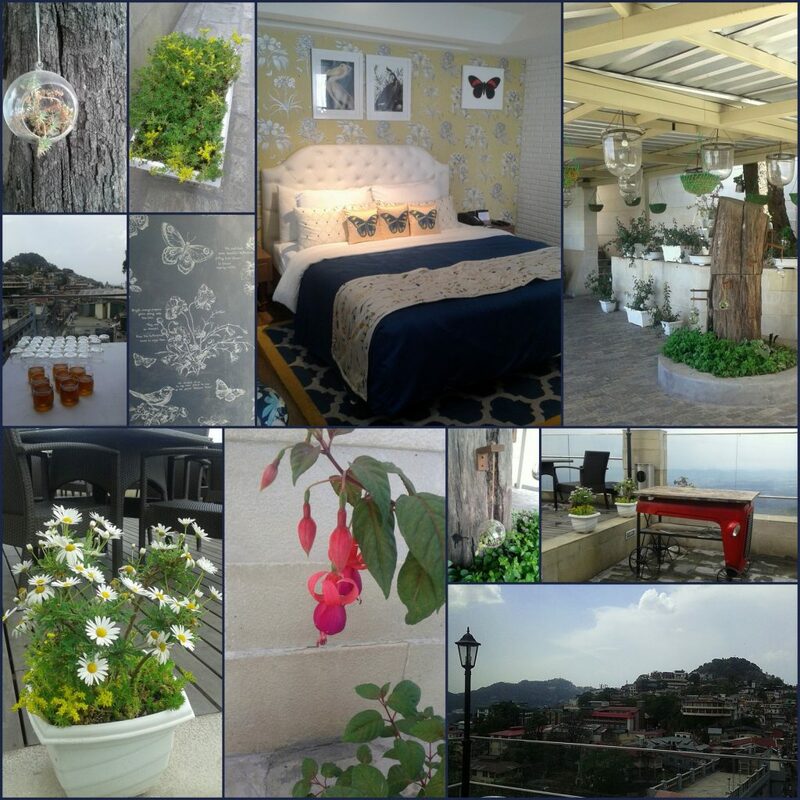 Perched on a Horse shoe shaped ridge, Mussoorie is at an altitude of about 6000 ft. We stayed at The Mosaic hotel right at the start of the buzzing Mall road, next to the taxi stand, near Picture palace. We chose this place for easy accessibility to the restaurants, market as well as hiring local conveyance(Cabs are not allowed beyond this point on the mall road)… and we are glad we did, the kids enjoyed their stay here. Our suite was spacious with a small living area, attached with an extra luxurious washroom (the lad teased the diva that she could sleep in there). Our Diva was already excited to see 2 TVs sets in the suite and a huge bath tub 🙂 Unlike the usual whites and pastels, this hotel room cheered us instantly with its yellow and Indigo colored floral and butterfly patterns. The huge comfy chair by the French window that opened up to the spectacular valley view became my favourite tea time spot for the next couple of days.The open balcony at the The Mosaic, offers a stunning view of the twinkling lights of Dehradun in the valley below at night. 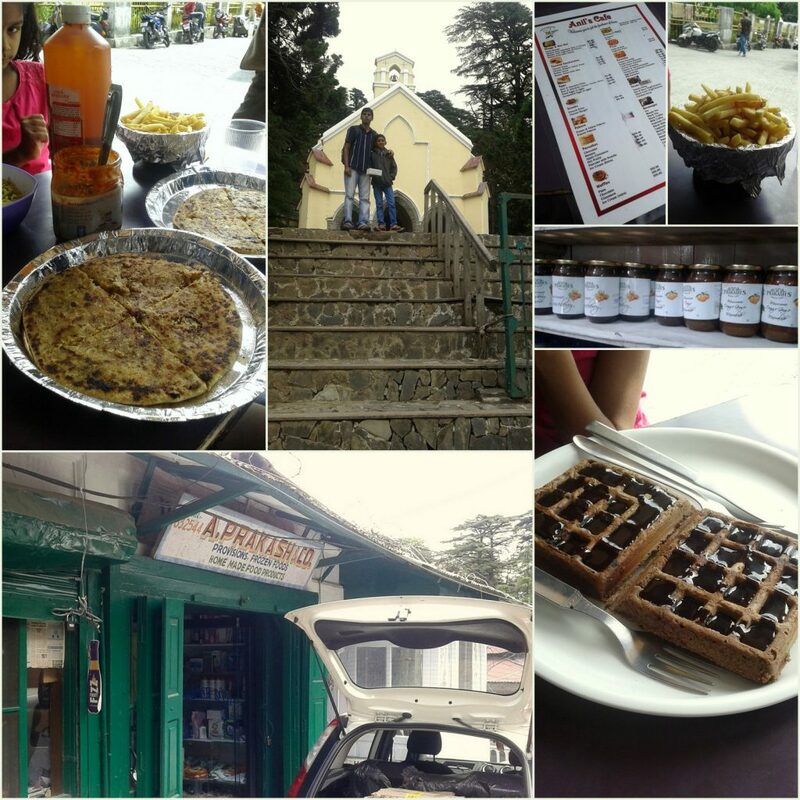 I had a list of must visit places for food in Mussoorie. I love to explore a place either through my lens or through its culinary hot spots. The lens I carried, but forgot the camera charger..sigh.. and hence you see most of the photos here had to be captured on my cell. ..so this is the point #1 of what not to do when you plan a trip- DO NOT FORGET YOUR CAMERA BATTERY CHARGER OR A SPARE BATTERY! Incidentally I had a nightmare a couple of days before we left for Mussoorie that I had forgotten to pack my favourite travelling lens! 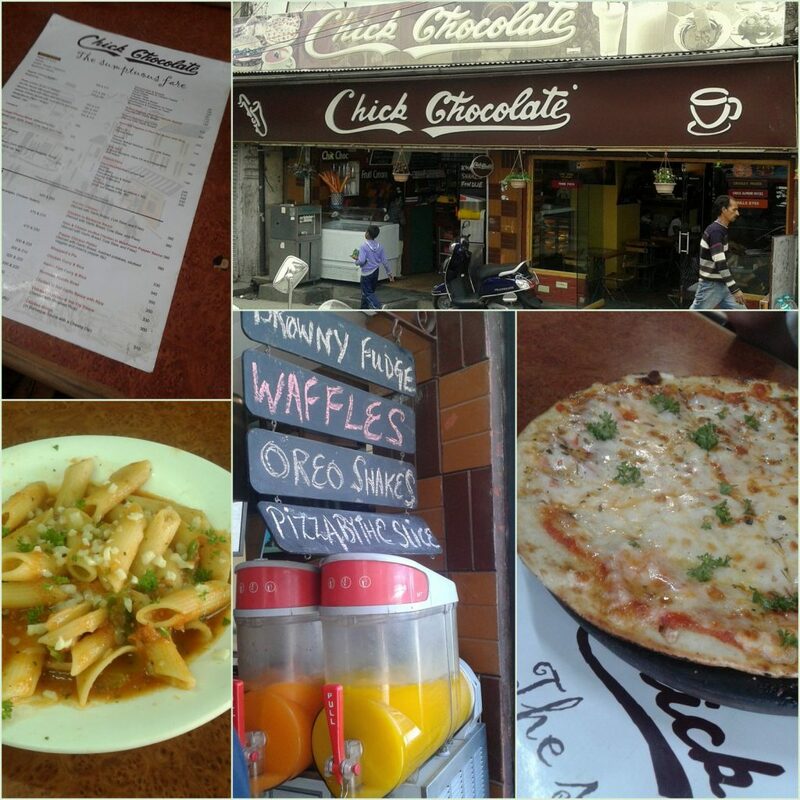 We headed straight to the Mall road and our first stop was at the famous Chick Chocolate. You can find everything from handmade chocolates to pizzas and chicken curry here. The Diva had a thin crust pizza, which was exceptionally good, while I had some pasta and the lad shared a rice-chicken curry bowl with his dad. Service was a bit slow maybe since the place was packed with tourists, but the food was very good. We returned here the next day again for some orange & Mango slush, Brownie Sundae and their famous sticky jaws to carry back home. 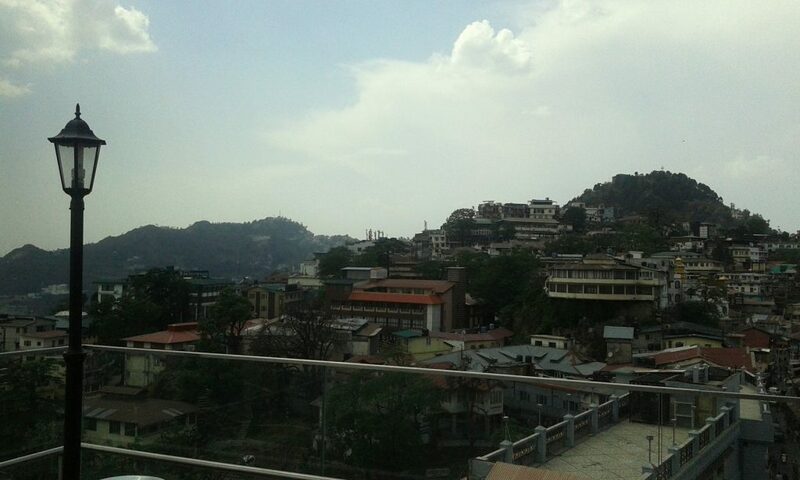 The weather in Mussoorie can be quite unpredictable. It rained on our first evening in Mussoorie and we weren’t prepared for the biting cold wind. We had to purchase some warm clothes from one of the many apparel shops that line the mall road. The lonely planet recommended Lovely Omelette centre had a queue and a waiting time of 1 hour. Kids did not have that kind of a patience and we skipped this. 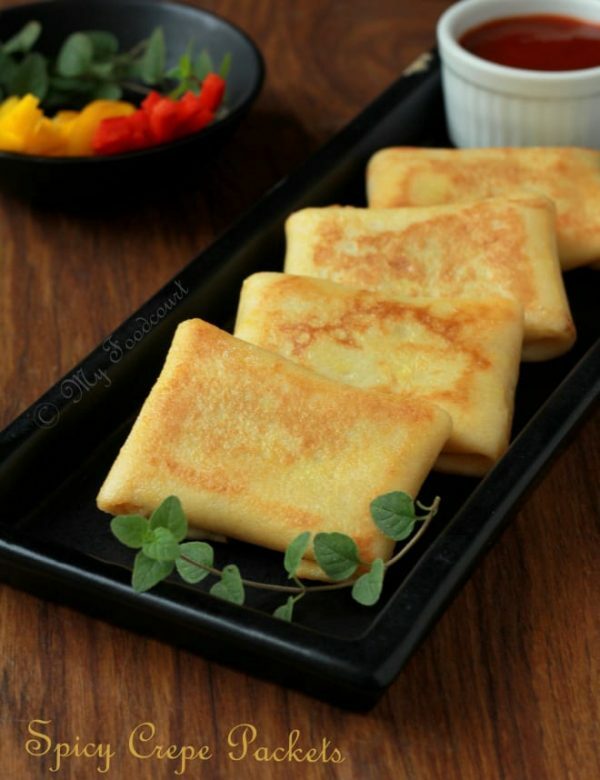 The mall road is bustling with activity and is a street food paradise. We spent the evening food hopping from stall to stall, starting with hot steaming milk topped with Malai (cream) served in the traditional Kulhads(earthenware). Stalls selling roasted sweet corns, Maggi, Momos, soups, chaats, icecreams and bakes dot the mall road. It was hard to resist the tempting bowls of Maggi at the omnipresent stalls. The veg Momos and Chole Kulcha that we tasted were mediocre but the cold weather and infectious energy around made up for it. 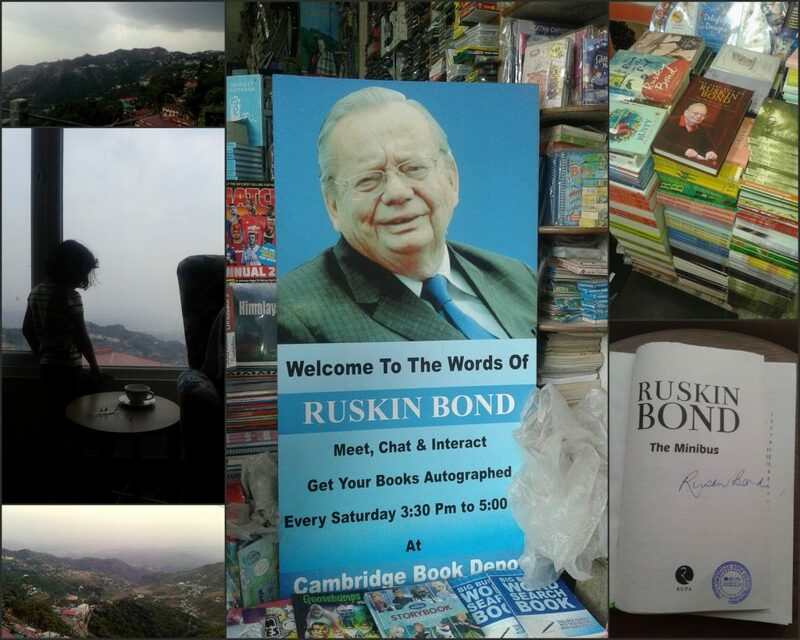 We were lucky even to catch a glimpse of Mussoorie’s famous resident and the acclaimed author Ruskin Bond, at the Cambridge Book depot, where he meets his fans every Saturday. We bought a few signed books as souvenirs for the kids and my nieces. 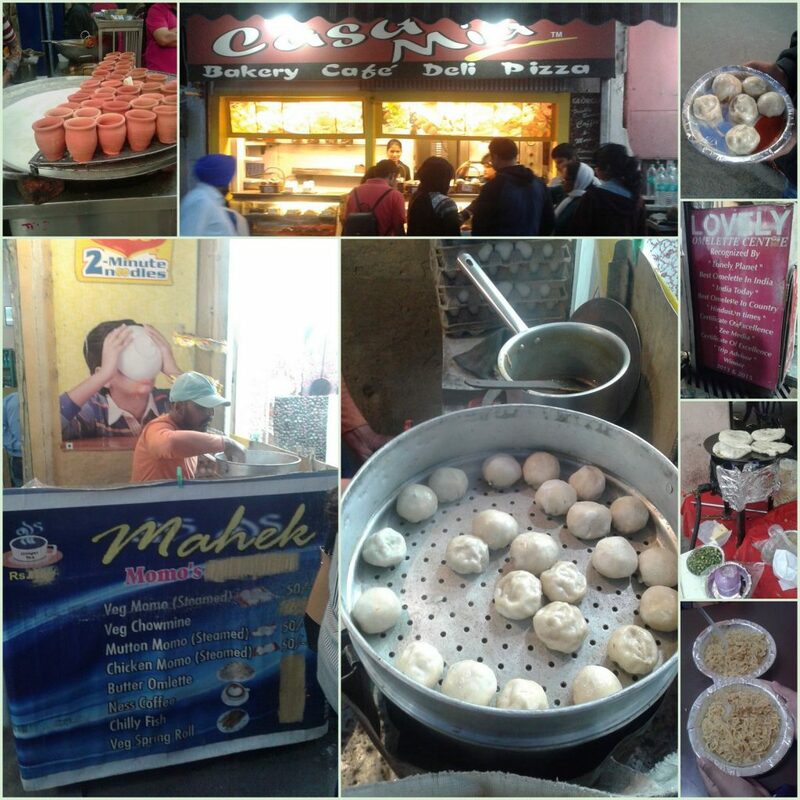 We ended our day 1 Mussoorie mall road food walk with treats from the tiny Casa Mia bakery. Danish pastry, brownies, blueberry cheesecake ,chocolate croissant and some cupcakes. Most goodies were ok but the lad wasn’t happy with his Blueberry cheesecake, ’there was no cream cheese’ he complained. The next day we decided to explore the other twin of Mussoorie- Landour. 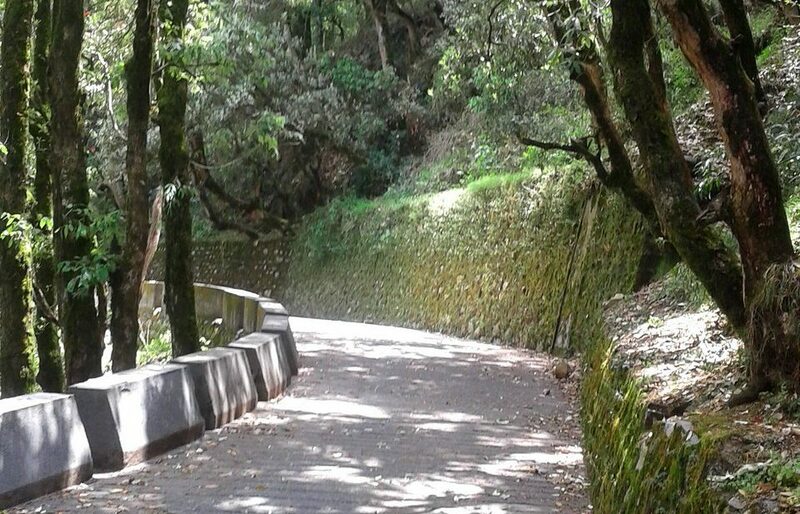 Landour is a quaint little cantonment town at an altitude of about 7,000 ft and just about 5km from Mussoorie. Though it looks like an extension of Mussoorie, Landour is still untouched by Mussoorie’s hustle and bustle. 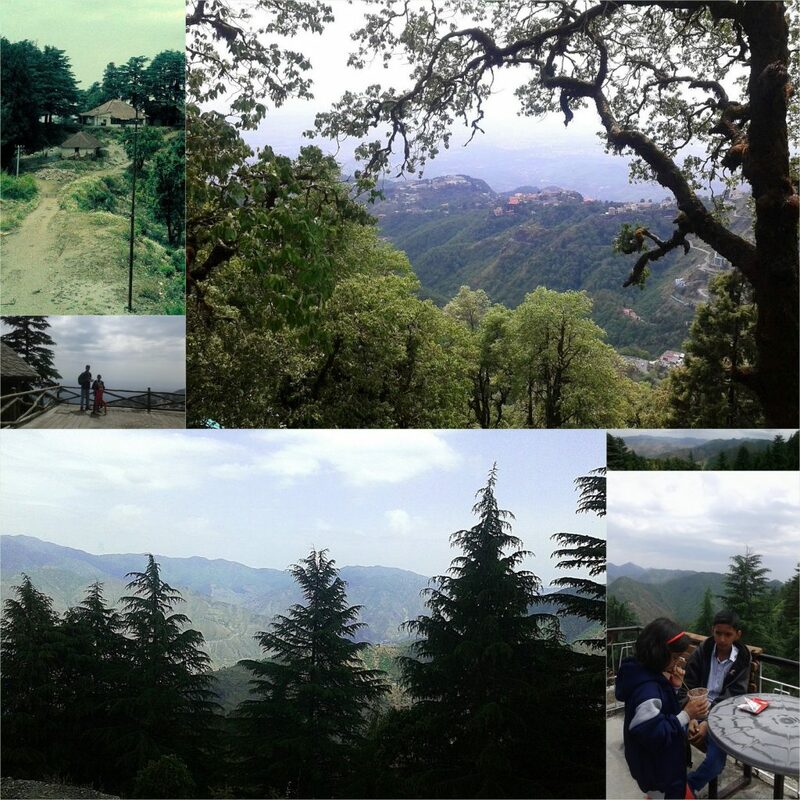 We took a cab to Lal Tibba , the highest point in Mussoorie/Landour. Binoculars placed on the terrace of a tall café, on the edge of the cliff offer a stunning view of the majestic Himalayan mountains. This facility is chargeable (Rs.20) and if you order some food at the café the fee gets waived off. The kids had a cold kit-kit shake while we enjoyed a cup of handmade coffee. We strolled down through the forest path (Gol Chakker) to Sister’s Bazar from Lal tibba. Cold, unadulterated forest air, Pine and Deodar tree lined path, this was one of the most incredible walks I have been on. Pretty flowers, chirping birds, monkeys and langurs swinging on trees, serene ,calm atmosphere- we just soaked in the beauty of nature. We passed by a few pretty Colonial style cottages, a cemetery and the Landour Language school. I had the Prakash store on my ‘to visit’ list. We had to ask for directions, but there was hardly anyone on the quiet road. 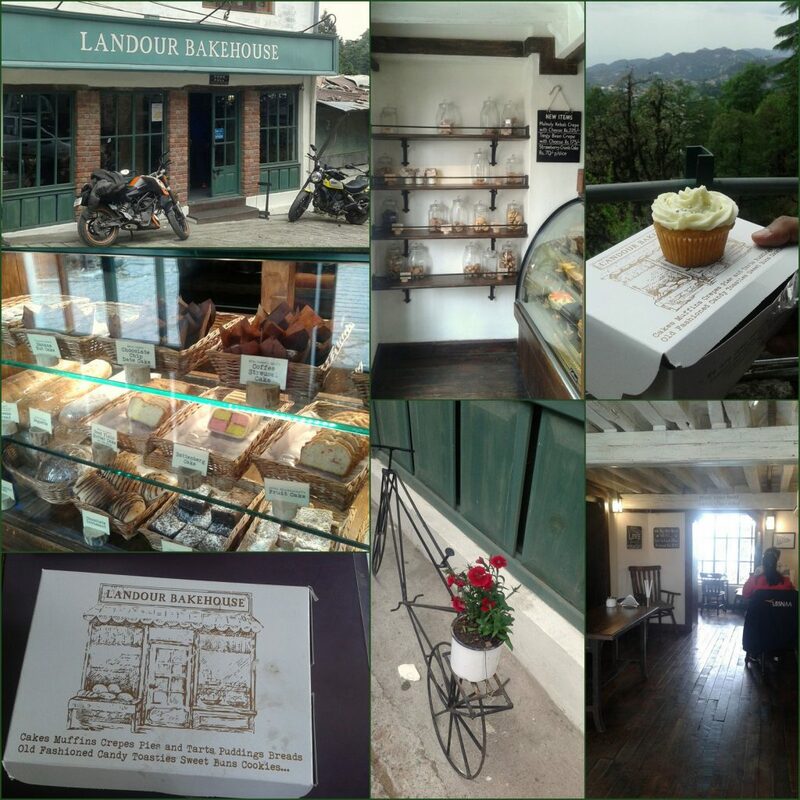 We kept walking and reached The Landour Bakehouse. 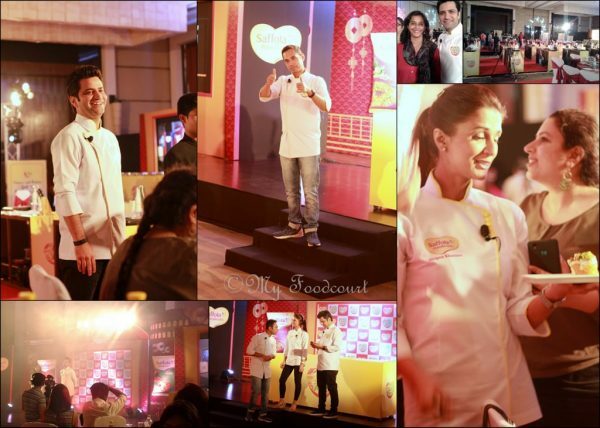 The aroma of baked treats wafting through the air made us enter this lovely bakery. As you step in this place, you instantly get transported to a classic 19th century European kitchen. I was most excited to see Madeleines and slices of Battenberg cake on display here. Their little café has a nostalgic, old world charm. You can relax and enjoy a steaming pot of tea or coffee or some hot chocolate with a magnificient view of the green valley. Next door to Landour Bakehouse is the famous Prakash store. Dimly lit, this old shop was packed with gourmet products. I was very confused what to buy (or what not to buy) I bought their homemade marmalade and gooseberry jam, yak cheese and some smoked cheese. I also bought another lovely treasure – The Landour Cookbook. I forgot to buy their famous Peanut butter though. That’s on my list for the next visit now. Serene laid back life, lush greenery, alluring valleys and the colonial charm of this beautiful hamlet in the lap of nature, made us fall in love with it. We then strolled down to Chaar Dukan,a small cluster of shops near the beautiful St.Paul’s church. Waffles, pancakes, Parathas, maggi (of course!) -you get it all here. The Diva loved her chocolate waffles and fries at Anil’s café. The lad was hoping to bump into Sachin Tendulkar who is known to frequent this place on his visits. We stuffed ourselves with some delectable Aloo and Gobi parathas served with dahi and pickle. In the evening we were back to the mall road which was abuzz with activity as expected. We tasted the Delhi style Aloo tikki chaat at a crowded stall, which was delicious. We then braved the rain and cold wind to hike up to the Little Llama Café. Both the boys ordered a Chicken Kebab Hummus platter and we ordered some pasta and garlic bread. The food was good but the service was very very slow even though there were very few visitors at the café. We ended the day with generous bowls of made to order ice cream sundaes at The Tavern restaurant. The kids had a oreo-chocolate icecream sundae and we had a triple fruit sundae. The only regret I had during this Mussorie-Landour culinary escapade, was that we could not taste local Garwhali food anywhere. When we enquired at the hotel during checkout, I was told by the hotel staff that we should visit Mussoorie during October-November to enjoy the local food festivals. Also if we had requested the chef earlier, he would have made some local delicacies for us. Point noted! 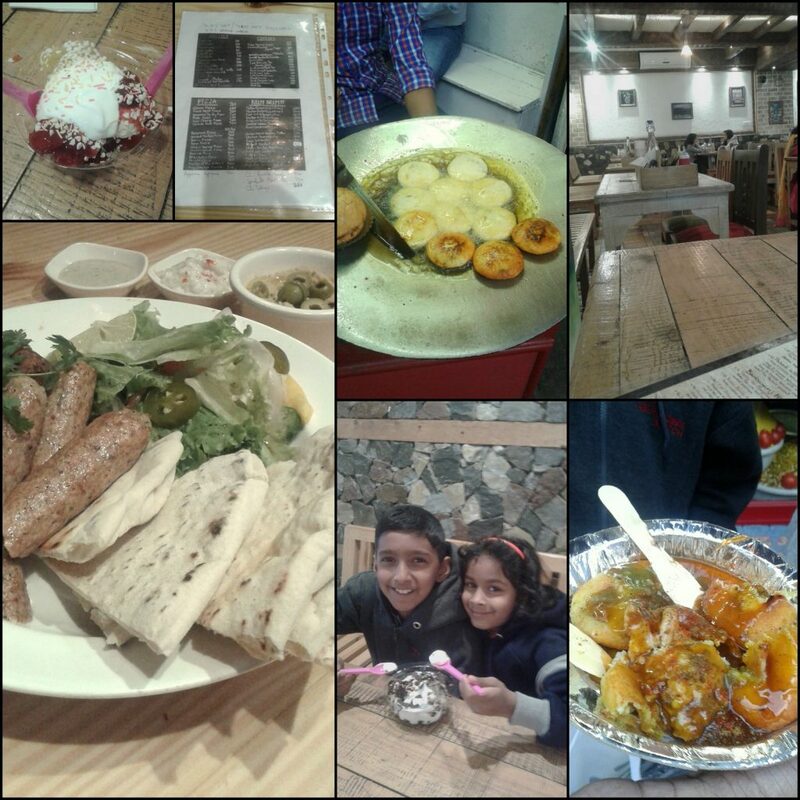 We stuffed our tummies with as much food as we could in 2 days, covering most of the recommended eateries in Mussorie. 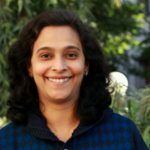 We missed seeing a few tourist spots of Mussoorie, the neighboring corn village of Sainji or exploring the beautiful cottages ,off beat trails in Landour. 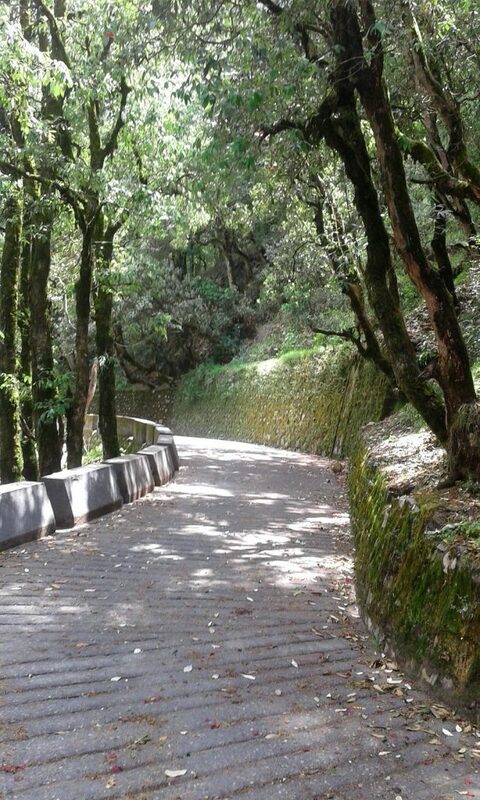 I left a little piece of my heart in the amazingly beautiful Landour and would love to discover it more on my next . Loved to read this post. Felt like almost being there. Your pictures were amazing. I invite you to visit our side of the hills – Kumaon. You’ll love the panoramic vistas and the grandeur of the Himalayas. Plan out a trip to Ranikhet, Kausani or Mukteshwar.